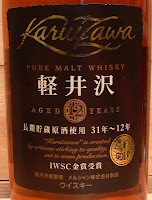 Karuizawa is a now closed distillery in the Japanese alps not too far from Tokyo. The single cask bottlings are much loved and hyped especially in Europe. These are my tasting notes for the not so well knows standard 12 year old standard bottling. There also are a 8yo Pure Malt and 15 & 17yo standards. This one is bottled at 40% and matured in sherry casks. Comment: Solid stuff, but it is quite hard to find nowadays. Generally it isn't too dissimilar to an Aberlour in this age range. Lacks a bit depth for a higher score.